Is your business faced with slippery surfaces that can cause a slip or fall? At the EverLine Coatings Winnipeg office we can eliminate the chances of a fall with the application of a non-slip specialty coating. Rain, snow, ice, and moisture can make for some slippery conditions around your property in Winnipeg. Slippery surfaces can create some severe liability issues and worse, injuries as people may slip and fall. At EverLine Coatings and Services, we offer non-slip specialty coatings to Winnipeg and its surrounding areas to prevent people from falling and injuring themselves on your property. 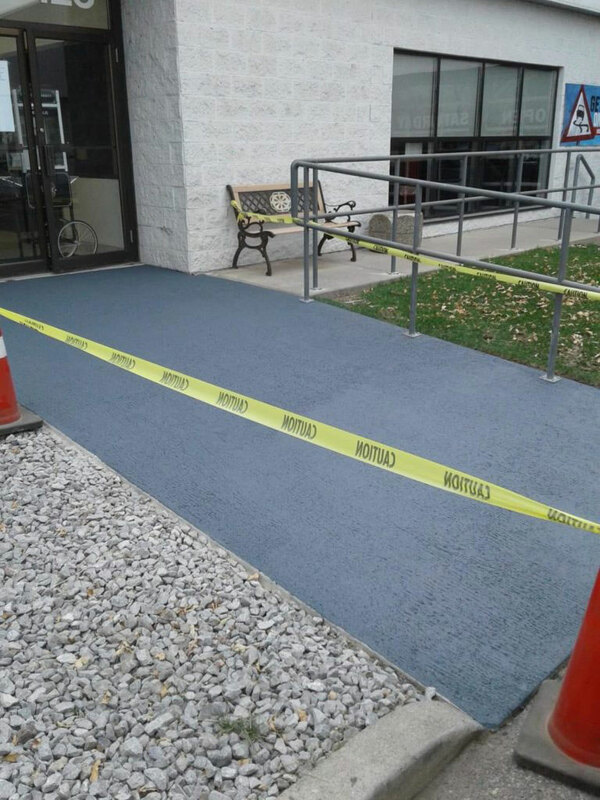 Our non-slip specialty coatings can be applied to high-traffic and high-risk areas to eliminate the possibility of slips and falls. Our non-slip coatings can be applied to many different surfaces with many different dimensions as well. In addition to the added safety, you get with one of EverLine’s anti-slip coatings; we can also customize the colour of the coating so that it will look great and keep your property safer for everyone. At EverLine Coatings and Services, we only use the best non-slip specialty coatings available. This is to ensure that every non-slip specialty coating we apply is effective for people walking around your property and that it lasts for a long time. We are also able to customize the appearance of the coating to increase safety and make your business look great. A significant contributor to our success is our unwavering commitment to our CORE quality system. CORE is an acronym that stands for clear scope, operations reports, reach out to clients, and evaluate. This ensures that we are always transparent with our clients and ensure we can exceed your expectations throughout every step of our projects. EverLine Coatings and Services has been installing non-slip specialty coatings for decades. Our many years of experience applying non-slip specialty coatings to surfaces and specialty training has established the non-slip coating crews at EverLine Coatings and Services as the industry’s coating experts in Winnipeg. It all starts with our rigorous training process. Our thorough training programs ensure that crew members know the products they are applying and that they have mastered the application techniques inside and out. Once a crew member has proven that they meet our high standards and that they can deliver high-quality results, they are sent out to serve our clients. We implement regular training programs and ensure that our crews are educated on the latest non-slip specialty coating products and equipment to ensure a job well done every time. You can rest assured that a non-slip specialty coating from EverLine Coatings and services in Winnipeg is going to look great and have great longevity. 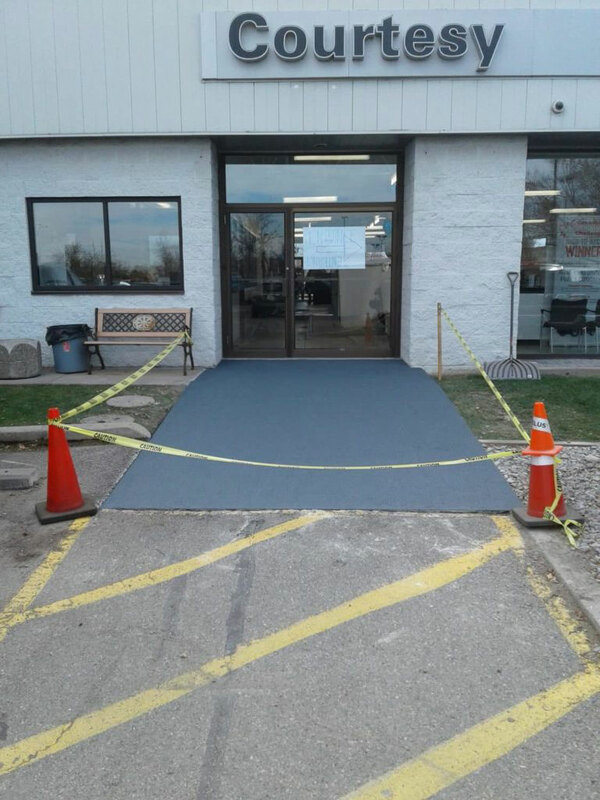 If you are having a non-slip specialty coating applied to your business in Winnipeg by EverLine Coatings and Services soon, there are a few steps you can take before our crews arrive to prepare. First, please ensure that the surface we are going to apply a non-slip specialty coating to has been cleaned and is free of any debris. This will ensure that the application can be completed promptly and ensure a good bond so that the coating is effective and will last a long time. Secondly, please inform anyone that may be walking on the surface that the work will be done and put up signs to people to know that there is a wet coating present. This will ensure that there are no interruptions and that no one walks through the wet coating and ruins the work that has been completed. At EverLine Coatings and Services, we work to provide the best possible value for our clients. Because of this, we understand that every job is unique and it should be treated as such. Every job that we complete is priced on a per job basis. At EverLine, we know that many factors could affect the application and we work to get all the details before we apply a non-slip coating to your property. By getting all the details and assessing the project, we can offer the best possible services and work with the unique budget of your business. If you need a quote for our non-slip specialty coating services in Winnipeg, please contact us.